Cotton-picking season is underway in Turkmenistan. The exile-run Chronicles of Turkmenistan claimed the campaign began on August 15 and that the first people sent to work in the fields were employees of state schools, hospitals, prisons, factories and banks, among others. State media outlet Golden Age, however, said that the large-scale cotton harvest would only begin on September 5. The former claim appears to be supported by a September 2 report from RFE/RL's Turkmen service, Radio Azatlyk. Azatlyk stated that a bus carrying teachers to pick cotton outside Turkmenabat collided with a passenger car on August 31. More than 20 people were hospitalized — a number of them were reportedly admitted in critical condition. In a rare intervention, state-backed outlet Turkmenportal cited a statement from the Ministry of Internal Affairs denying any such incident had occurred. Straining the credibility of the denial, however, officials insisted that "during August and early September, there has not been a single major traffic accident in the whole country." In other transportation news, Turkmenistan has been turning back many Tajikistan-destined trucks arriving from Iran. This has led to major backlogs at the Iranian-Turkmen border and the Uzbek-Turkmen border. A trucker told Eurasianet he had been stuck waiting for over a week. This cannot but take the shine off Ashgabat’s boasts that Turkmenistan is emerging as a transportation hub for the 21st century. Undeterred, Turkmenportal argued in a September 2 article that "Turkmenistan constantly demonstrates its readiness to deepen global transport dialogue and initiate concrete plans and projects." One of the projects mentioned is the planned Turkmenistan-Afghanistan-Tajikistan railway, although the delays that particular undertaking has faced makes the plight of the stranded truck drivers look like child’s play. Demonstrating just how important transportation matters are to President Gurbanguly Berdymukhamedov, he ordered Road Transportation Minister Orazdurdy Sukhanov, Interior Minister Isgender Mulikov and Deputy Prime Minister Mammetkhan Chakyev to organize an annual transportation exhibition, according to state news agency TDH’s summary of the August 31 Cabinet meeting. Berdymukhamedov also received a new driver's license at the meeting so that he can take part in the September 9-15 Amul-Khazar car rally, for which he has spent much of the summer practicing. TDH noted that 200 tons of diesel and 200 tons of gasoline will be given free to rally participants. Nonetheless, the conference apparently led to meetings with representatives of a number of leading companies in the ensuing days. Perhaps the most notable encounter reported by TDH was that between Berdymukhamedov and Sang-rok Sung, chief executive of South Korea's Hyundai Engineering, on August 30. Sung reportedly suggested new proposals for infrastructure projects, although TDH gave no indication of what they were. TDH reported that Berdymukhamedov also met Gilles Remy and Alain Bonnot, the heads of French construction companies Cifal and Vinci, respectively. Borrowing from a trick in flattery beloved by the late President Saparmurat Niyazov, the pair presented Berdymukhamedov with a French-language translation of one of his many books — Turkmenistan is the Heart of the Great Silk Road. Remy, who heads the France-Turkmenistan Chamber of Commerce, clearly has experience glad-handing the Turkmen leader, whom he also met in 2012, according to Cifal's website. Although Vinci is one of the very few multinational firms that actually lists a Turkmenistan office, Berdymukhamedov’s remark about that the companies being involved in the country’s “large-scale town-planning program” was not previously known. According to TDH, Berdymukhamedov also met with the co-founder of ILF Consulting Engineers, Adolf Feizlmayr. The pair reportedly discussed partnering on the Turkmengaz-led Turkmenistan-Afghanistan-Pakistan-India, or TAPI, pipeline project. As Berdymukhamedov discusses bringing in more foreign engineers and construction firms, the Turkmen population continues to suffer from a major economic crisis. On August 30, the Chronicles of Turkmenistan, which is run by Europe-based exiles, reported that chicken meat had largely disappeared from markets over the previous two weeks. Another report it published two days later noted that the only chicken that could be found, and in small quantities at that, was that produced under the Gus Toplumy brand. Gus Toplumy is run by Alexander Dadayev, head of the country's Union of Industrialists and Entrepreneurs and a firm government loyalist. On September 1, the same outlet said there was a shortage of supplies for vegetable oil in Ashgabat. When it comes to big-ticket items though, Turkmenistan always seems able to drum up new funds. 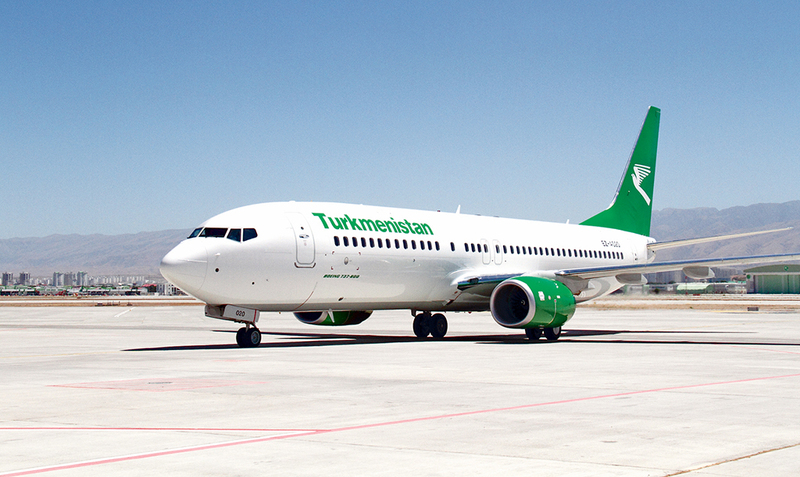 Turkmenistan Airlines is to purchase new planes from Boeing, although state media provided no details of the models or the number of units being bought. The airline last took delivery of a Boeing 737-800 in June 2017 and reportedly has plans to double the size of its fleet by 2030. While the aircraft stock may become more modern, practices at Ashgabat airport remain locked in the Soviet era. Azatlyk reported on September 1 that the security services have set up new checkpoints at Ashgabat airport in such a way that travelers now have to face customs, then the migration service, and then finally a grilling by National Security Ministry officers. While some are waved through, other face considerable cross-questioning, according to Azatlyk’s sources. Turkmen workers abroad are facing increasing restrictions too, with Turkish-controlled Northern Cyprus reportedly now requiring they obtain visas amid a reported influx of labor migrants. With the forced cotton harvest at home, the economic options for Turkmen laborers are dismally limited.